Last Thursday and Friday, Jackson State University’s Community Service/Service Learning Center coordinated various community service projects as part of Orientation Week for the university’s freshmen. I served as a chaperon for 19 of the 362 freshmen that showed up on Thursday to volunteer. While many of the students in my group were from Jackson (Forest Hill, Jim Hill, Provine, Wingfield, and Murrah grads to be exact), there were also students from Chicago, Louisiana, Huntsville, Alabama, Florida, and Memphis. Most importantly, the group was a LOT of fun! My group’s assignment was to assist with duties at the Capitol Unit of the Boys and Girls Club (1450 W. Capitol Street) here in West Jackson. Mr. Randall Gray, Unit Director, greeted us as we filed into the club. Then he began to tell us the story of the importance of this facility. The Capitol Street facility serves 200-250 children during the summer months and 300-380 children during the school year. Mr. Gray attended this very club between the ages of 6 and 9. Oh, and the cost to the parents per child is a whopping $25 per year. That’s right, $25 per YEAR! Of course, it costs the Boys and Girls Club a lot more per child, but the goal is to make sending children as affordable as possible to parents who may not otherwise be able to afford daycare or after-school care. So, how many children were present during our visit? Zero. Zip. None. Why? Mr. Gray explained to us that the organization has encountered serious budgetary difficulties that have caused many of the facilities to close until the first part of September. That means that many of the 300-380 kids that would have been joyfully playing and learning at the club are probably at home alone. 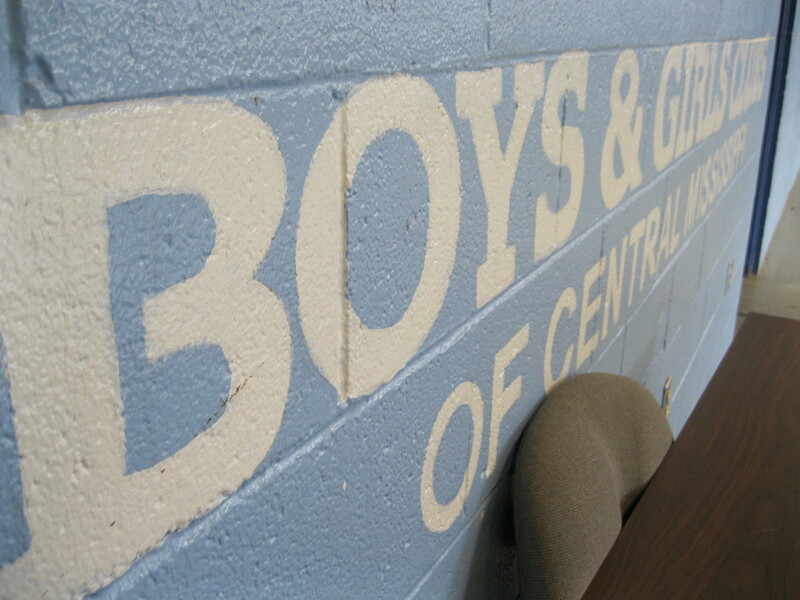 The Boys and Girls Clubs of Central Mississippi is in dire need of mentors and financial contributors. If you’d like to contribute to this organization, please visit their website at http://www.bgccm.net/donate.htm. As for my group of JSU freshmen, all 19 of them contributed 3 hours of service as they organized the game closet, painted the classroom and cubby holes, mopped the gym, and took out the trash of this important West Jackson facility. In all, 830 students participated in the two days of service. In addition to the Boys and Girls Club, they volunteered at the Christian Mission Learning Center, Stewpot, Operation Shoestring, West Jackson CDC-Youthbuild, Women’s Resource Center, Neighborhood Christian Center, Computer Recycling Center, and the WIC Center. JSU students must earn 120 community service hours before graduating, and for the freshman, these two days provided a great start to reaching that goal. Hi, enjoyed your story about volunteer credits at JSU. It is sad youth cannot go to the BG Clubs now. It would be good for you to add the Alamo Theater to your volunteer list. You would talk with Erma Johnson at 601-3726369 to establish that opportunity. We have events from time to time and always need volunteers. We are a 501-c-3 group so I hope you put us on your list. Thanks for reading Marcia! If you all need volunteers, ask Ms. Johnson to call Mr. Timothy Abrams, Assistant Director of the Community Service/Service Learning Center, at 601.979.6938. He’ll be able to better explain the process of recruiting student volunteers.